Book & songs by David Wood. Incidental music by Peter Pontzen. 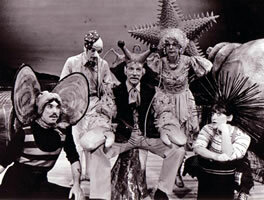 Commissioned by the Farnham Repertory Company, the play was first performed in 1983 at the Redgrave Theatre, Farnham. 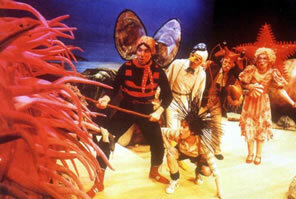 Later that year, Whirligig Theatre toured the play throughout the UK, including Sadler’s Wells Theatre, London. 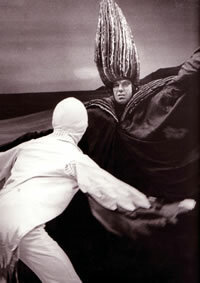 There have been several foreign productions, including South Africa, and the play is popular with amateur companies. 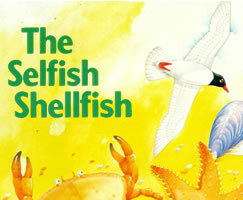 THE SELFISH SHELLFISH looks at a serious contemporary issue in an entertaining, though not flippant, way. The author hopes that young audience’s concern about oil pollution will be encouraged by this story. Life for the Rockpool dwellers is full of uncertainty. Every new tide brings fresh surprises or new problems. The audience joins in the battles with the Great Slick and his henchman, Sludge. The song WHEN WILL WE LEARN? is often used by schools, as an environmental anthem. David Wood writes : I was delighted when Stephen Barry commissioned this play for the Redgrave, Farnham. 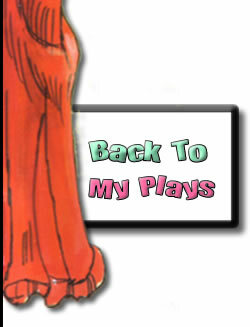 Thankfully he didn’t ask for a commercial title, which meant I could write an “issue” play. Sadly, a few years on, the play is still very topical. The play was first published by Amber Lane Press. The acting edition is published by Samuel French Ltd. The music for the songs and the incidental music is available on hire from Samuel French Ltd First Class Professional & Foreign Rights : Casarotto Ramsay Ltd. UK Repertory Rights : Casarotto Ramsay Ltd. UK Amateur Rights : Samuel French Ltd. US Stock and Amateur Rights : Samuel French Inc.